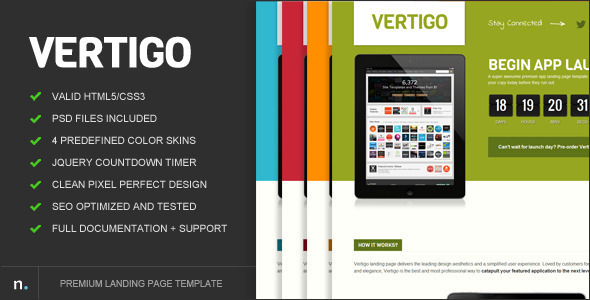 Vertigo is an awesome premium landing page which will work great in promoting an app launch (thanks to the jQuery countdown timer), or any other kind of product launch you may have. The landing page is easily customizable as it comes integrated with LESS stylesheet functionality. I’ve even created 4 predefined skins for you just to prove how easy it is – it literally took me under 10 minutes to create these additional skins. It’s really that simple. That being said, if you do run into any issues then I’m only an e-mail away, so feel free to contact me if you need to, or if you just want to say hi! If you have questions or comments, please feel free to submit those to the Item Discussion section. If you have purchased the theme please take a minute and rate it as I would really appreciate it. Thanks again!